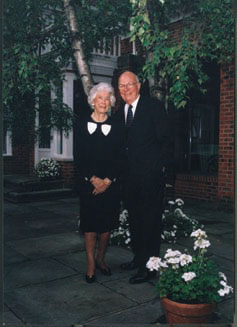 For more than six decades Mary Elizabeth and G. Robert Klein were an exemplary philanthropic team. Together, they supported and encouraged countless cultural and civic institutions. Individually, they brought a unique blend of energy, enthusiasm, commitment, and vision to leadership positions in more than 30 not-for-profit organizations throughout the Greater Cleveland area. In 1997 the couple was honored by the Cleveland Arts Prize with a Special Citation for Distinguished Service to the Arts. Their leadership and wisdom have also been recognized nationally. Both served on the Metropolitan Opera board. The Kleins' commitment to “live” theater is legendary. Stalwart supporters of the Cleveland Play House (in whose hall of fame they are honored) and Great Lakes Theater Festival, they encouraged and supported both the development of new scripts at the Play House and the company's history-making tour of Prague and Bratislava in 1993. In the late 1990s, when he was in his 80s, Robert chaired the Play House's successful $12 million endowment campaign. The Kleins also supported and invested in several smaller Cleveland theater groups. The indefatigable couple once attended more than 50 theater productions annually in Cleveland, New York, and London. Mary Elizabeth, who died in 2002 at the age of 91, herself produced or directed more than 20 plays at the Church of the Saviour in Cleveland Heights. Generous gifts from the Kleins have, in addition, supported the composition of seven new works for the Cleveland Orchestra and the Cleveland Orchestra Youth Orchestra, including a symphony by composer Raymond Premru, the 1997 winner of the Cleveland Arts Prize for Music. But the Kleins' passionate commitment to organizations and projects that nourish a sense of community, along with their hunger for truth and beauty, was not limited to so-called “high culture.” They were longtime supporters of the Cleveland Metroparks Zoo and its transformation into a visitor-friendly walking park of natural wonders (including plant species and exotic habitats) from around the world. A substantial gift from Robert and son George Klein made possible the development of the zoo's singular Wolf Wilderness exhibit. Bob Klein has had a distinguished business career, serving from 1945 to 1977 as president and chairman of the board of the George R. Klein News Company, a major regional distributor of publications to newsstands and other outlets. A past president and life trustee of the Cleveland Play House, he has also been an active trustee of the Cleveland Institute of Music, Midtown Corridor Development Association, the Musical Arts Association (which operates the Cleveland Orchestra and Blossom Music Center, the orchestra's summer home), and University Circle, Inc.
Mary Elizabeth (who met her husband at their alma mater, Ohio Wesleyan University) was a trustee of the Cleveland Institute of Music, the Cleveland Play House, Great Lakes Theater Festival, Lake Erie Opera, and the Women's City Club of Cleveland. She also served as the president of the women's committees of the Cleveland Institute of Music, the Cleveland Orchestra, and the Play House. As a member of the Womens Council of the Cleveland Museum of Art, Mary Elizabeth volunteered regularly at the museum's information desk. The Kleins' total commitment to the arts made them leaders not only to be admired but emulated.